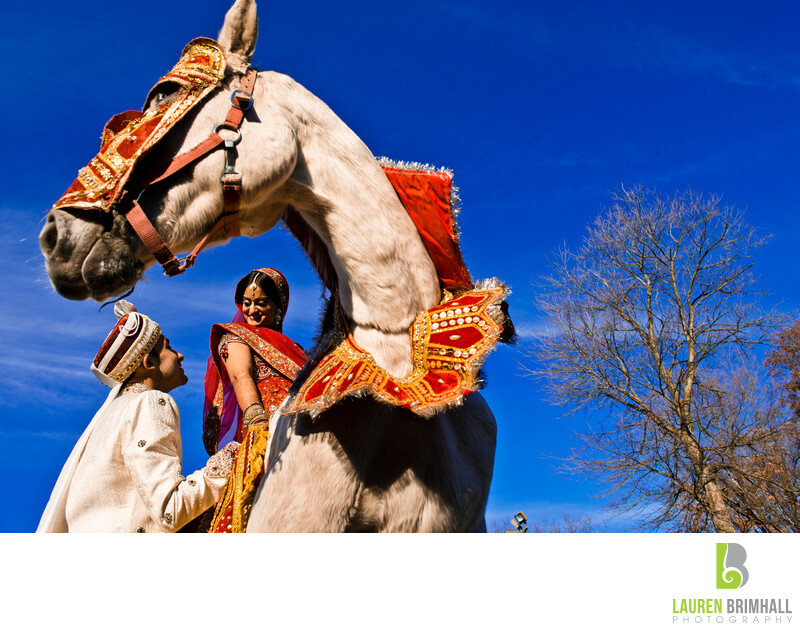 This portrait of a beautiful South Asian Couple with the horse from their Baraat was taken during a traditional Indian wedding at the Sheraton Parsippany in Parsippany, New Jersey. The couple were married in the Fall of 2013, and it was Lauren Brimhall Photography’s first Indian wedding. This special culture-rich event opened the door for the company to shoot many more gorgeous South Asian Weddings in the years to follow. In order to capture this shot, the photographer was lying on her back beneath the ornately decorated horse for a period of time waiting for him to turn his head to the left and complete the desired composition. It was a perfect blue-sky day and the sun was hitting the couple and the animal in just the right places. The bride’s red sari with gold accents, perfectly complements the white stallion’s decorative red and gold mask and collar piece. The splashes of red make the couple stand out against the rich blue sky, which is at the total opposite of the color spectrum. Lauren Brimhall also photographed the couple’s Philadelphia Engagement Session and Sangeet at Aashirwad Palace in Randolph New Jersey the evening before. Location: 199 Smith Rd, Parsippany, NJ 07054.